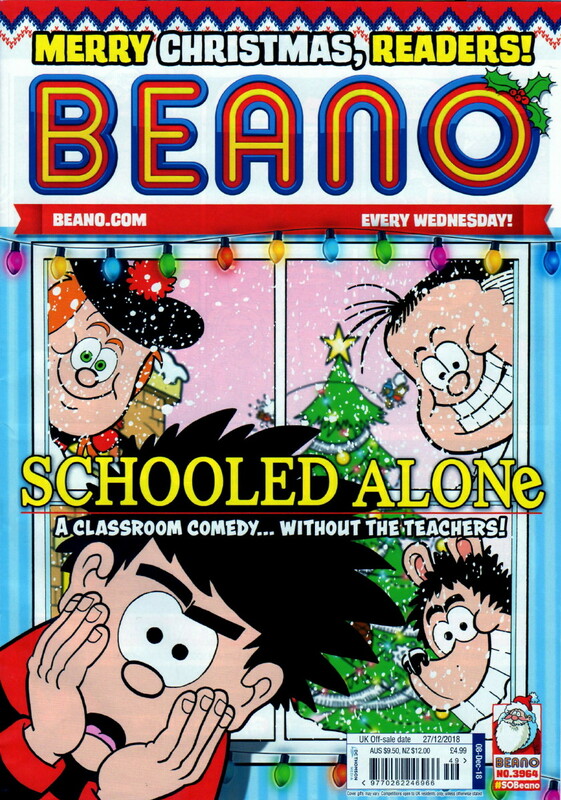 I've only just received it from the publishers (missed it in the shops, had to order it direct from DCT), so here's a belated BEANO review of #3964, the Christmas issue for 2018. Not a big fan of the tat that comes with it, but perhaps kids will love it, though I suspect the ones that do will be at the younger end of the spectrum. However, didn't mind the poster and joke book as they're the sort of things I'd have liked as a kid. 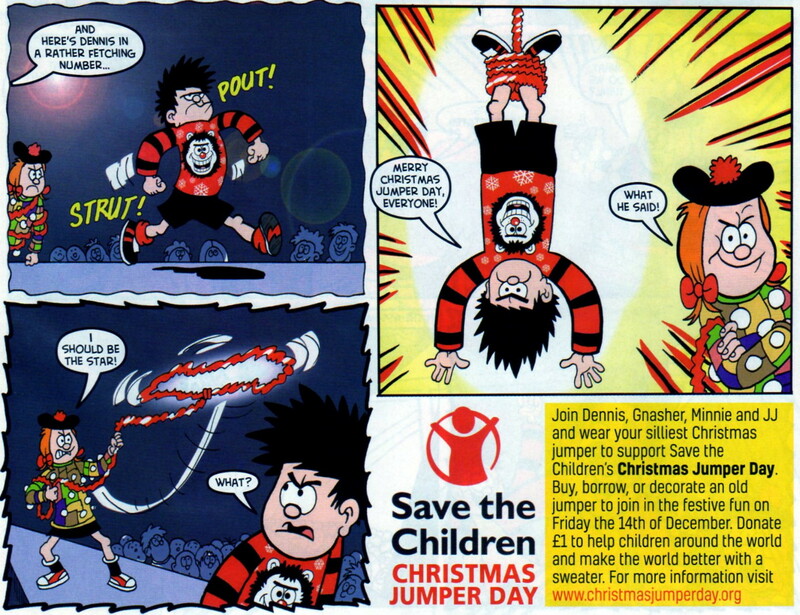 I've been buying the Christmas Beano every year since 1978 and 40 years later I'm still doing so, but I'm undecided as to whether this'll be my last or not. 40 years is a long time, but then again, 50 years has a nice ring to it and it's only a further 10 issues, so maybe I'll keep going until 2028. I'll wait until the next one before I make up my mind. So, what's the verdict? Got quite a few chuckles out of it so it gets a thumbs up, though I'm not sure I like the idea of Beanotown where all the characters live and attend the same school. I think I preferred things when, the occasional guest spot or symbolic cover aside, each character seemed to operate in their own self-contained environment. Also don't like the feminist agenda of having MINNIE The MINX getting the better of DENNIS The MENACE (he is supposed to be the star of the comic after all), nor the tag-line of 'She's tougher than all the boys...' Dennis is diminished by this sort of thing and this sort of PC indoctrination on behalf of the 'sisterhood' doesn't really belong in a comic. By all means make her the equal (as she always was) of Dennis (and ROGER and the like), but not his superior. Still dislike the 'new look' Dennis's Dad and would prefer to see the original DAVEY LAW version. 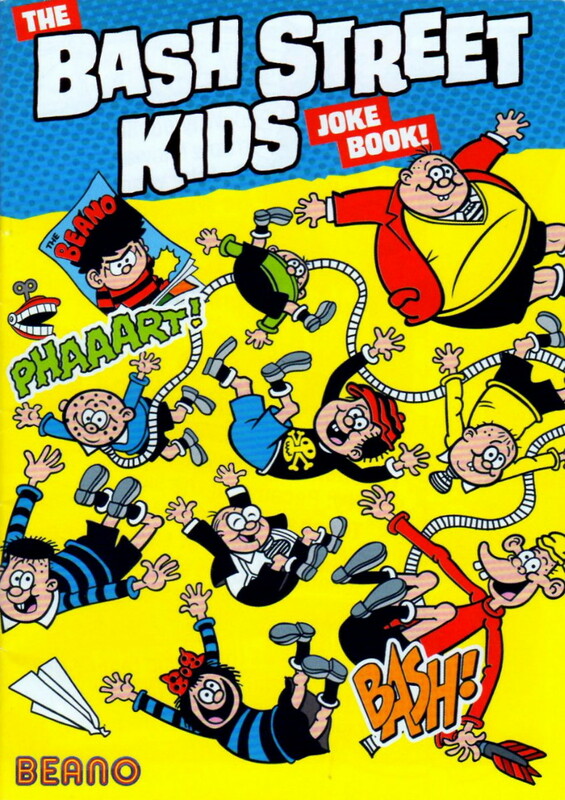 It's been sort of suggested in a previous strip or two that Dad might be the original Dennis that my age group read when we were kids, and the current one is his son, but that wouldn't explain GNASHER & GNIPPER, nor him being contemporaneous with the original BASH STREET KIDS and other characters. However, this sort of thing will only bother some long-time readers like myself, not the current crop of younger readers unaware of the characters' histories. So, my usual nitpicking aside, it was good to continue a 40 year tradition and add this issue to my collection, and, overall, I enjoyed it. I still prefer the 'classic' look of Dennis, but the art is of a professional standard and the absence of the inferior art style that dominated the doomed DANDY in its final couple of years was reassuring. I still wish it was a standard weekly issue instead of a boxed 'special', but perhaps that's just my personal nostalgia for the past speaking. Did you buy this issue, readers? (And if so, are you brave enough to admit to it if you're an adult?) Share your opinion of it in our comments section. Haven't bought the Beano in YEARS, but I'm glad it's still going with some of the classic characters. Didn't Dennis revert to his 'thug' look, though? I read something about it and saw a particularly big-chinned Dennis on some publication in a shop recently; probably the annual. Shows how much I've kept up. I was a fan of Minnie, especially with Jim Petrie's high-energy, madcap art, but this development... welcome to 'current year', Kid. Back then I had no problem with Minnie besting all the boys (at least in her own strip*) but I think the difference between then and now is a joint problem that affects writing and media across the board: 'show, don't tell', and the new iteration of the Mary Sue. For the former - I'm left with an impression of old Minnie's strips demonstrating how she was tough and wily. From your description, I'd guess writers and editorial go with that tagline in an attempt to convince the readers, rather than using the story for that purpose. For the latter - think Rey, or the 13th Doctor, or Captain Carol Danvers, that kind of thing. Not so much an author's self-insert these days, at least not directly: more of an ur-woman, a collective feminist insert (with all the individual personality that implies) who's automatically superior, hyper-capable and all-beloved simply because she has two X chromosomes. At least that's how the thinking goes. They can't understand when people complain about why character, relatability, and growth (and in some cases: acting ability) were left by the wayside. Anyway, that's just my general little hangup rant. As I said, I haven't kept up with the Beano in a while. Is Minnie's invincibility a common thing in the regular comic, outside of the Christmas Issue? * Is Fatty still in it, or was he airbrushed for body shaming? Dennis was, as you know, WJB, made a bit too cutesy-looking a while back, but was eventually returned to something resembling his more traditional look - probably after complaints, I wouldn't be surprised. However, he's still not quite as rough-looking as he used to be, sometimes appearing to be an amalgam of the two extremes. Very insightful comment, and can you imagine the fuss if there were a tag-line about a male character that said 'He's smarter than all the girls...' or something like that. I think DCT should change the line to 'She's as tough as any boy...' - although normally I'd say that's hardly something to aspire to, but it IS a comic and allowances have to be made for comedic effect I suppose. I'd guess it's a cross between show and tell in the strip, with the tag-line reinforcing what is already evident in the story, in effect serving the purpose of a 'mission statement'. Having said that, however, I'm not a regular reader of the weekly any more, and only get the occasional special issue and Christmas edition, so maybe not all of Minnie's story's have her duffing up the boys. And you'll be glad to know that Fatty's still in it. 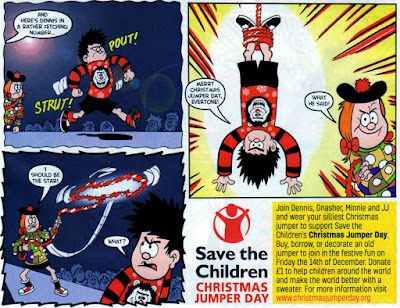 I bought the Beano Christmas issue a few years ago and the Beano Christmas Special last year and the year before, but I didn't buy anything this past Christmas (didn't even see the Christmas Special on sale). But why, Kid, did you wait until 1978 before collecting the Xmas issue? And why haven't you acquired any Xmas issues pre-1978 from e-bay? It just so happens that I bought the 1978 Christmas Beano when I was down in Southsea, CJ, and for some reason it became a habit in subsequent years. 1978 was the year I joined the Dennis The Menace fan club, so maybe that had something to do with it. Old Christmas editions usually cost quite a bit on eBay, and as I have a book containing every Christmas cover of The Dandy & Beano from 1937-1969, I don't really feel the need to buy the actual issues. Never say never though.